The Cavision MB412H-2A 4x4 Hard Shade Matte Box fits a large variety of cameras and lenses including both Broadcast and Mini DV camcorders. Matte Boxes enable the user to add more control to the image; perfect for those videographers shooting film style and event shooters wanting to upgrade their image quality. Matte Boxes allow you to control light better than a regular lens shade and offer the user the ability to use high quality 4x4 glass filters. 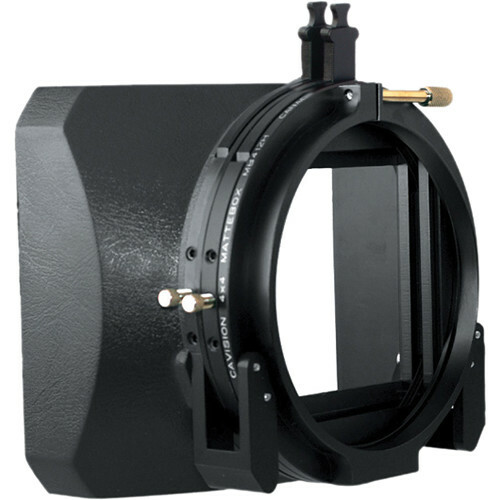 This unit comes with two filter holders for excellent control and filter stacking. One is fixed; the other, rotating for use with circular polarizers and gradient filters. With the addition of optional ARP adapter rings this unit will adapt to a wide variety of cameras and lenses including both Broadcast and Mini-DV video cameras. With the French Flag (MBF4H), you can position it to cover the hard sunshade or at various angles depending on the user's application. This model incorporates a 120mm back mount opening for use with the optional ARP series adapter rings. Dimensions (WxHxD) 7.28 x 7 x 3.74"
Box Dimensions (LxWxH) 8.5 x 8.4 x 4.5"